This is simply a video overview of my previous post on astrophotography barn door trackers. After lots of questions about how to use it, I thought a video might come in handy! 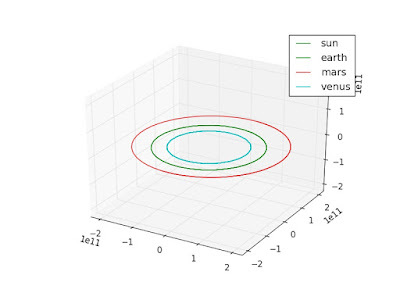 In a previous post I introduced a simple orbital simulation program written in python. In that post we simulated orbits by simply taking the location, and velocities of a set of masses, and computed the force on each body. Then we calculated where all the bodies would end up under that force a small time step into the future. This process was repeated over and over again, and was used to simulate gravitational systems like our solar system giving outputs like you see below. This technique is called the Euler method. 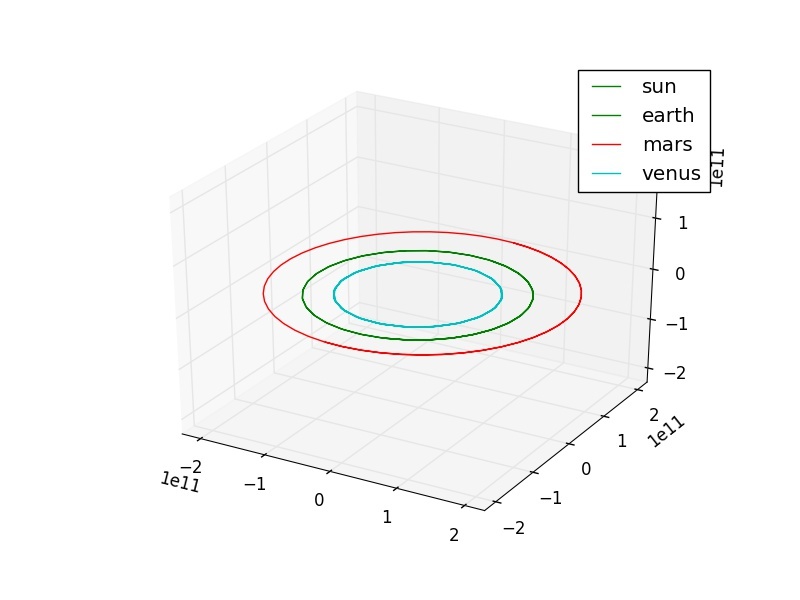 If you're not familiar with using numerical methods to simulate orbits, I'd recommend taking a look there first! In this post I will be adding a more advanced time stepping technique called the Fourth Order Runge-Kutta method. Kids these days just call it RK4. I'll walk through the logic behind RK4, and share a python implementation. I will also link to a C++ implementation, and do a brief performance comparison. In a previous post, I showed how you can build a smart mirror with an Alexa voice assistant on board. The MagicMirror software and Alexa voice assistant were both hosted on a Raspberry Pi, but unfortunately there was no obvious way to get Alexa to control the smart mirror, or deliver commands to the Raspberry Pi. I have now found a solution that is free, reliable, and very flexible. This is done by writing an Alexa Skill that adds a message to a cloud hosted queue based on your voice command. The Raspberry Pi repeatedly checks this queue for new messages, and runs customizable behaviour based on message contents. This is not limited to smart mirror applications, or Raspberry Pis. It can be used to launch any script you want on any platform that will connect to Amazon's SQS. Schedule a task on your Raspberry Pi to read queue messages and take appropriate action. This is a fun and very easy project I came up with while trying to build a wireless shutter for an iPhone. I knew selfie sticks could trigger your camera shutter, so I was trying to find out what information they were sending through the 3.5mm aux port (aka headphone plug) to do this. In this process I learned that headphone volume buttons will also trigger the camera shutter! So I plugged in some headphones with volume control, and tried to come up with a way to attach my phone to a stick. I came up with the spatula sponge elastic combo you'll see here. In this post we're going to build a Markov Chain to generate some realistic sounding sentences impersonating a source text. This is one of my favourite computer science examples because the concept is so absurdly simple and and the payoff is large. This will be done using python, and your final code will look like this. "The first step to attach our mirror is done by simply screw the backing with a Raspberry Pi's into the filename. That looks like installing and blinking cursor. Type the wood screws. Extension Cord with multiple passes of the all Together Once it hasn't really stuck in place until all directions. Clean your monitor." So it's not exactly coherent, but it comes pretty close! I also built a twitter bot called mayhem_bot (git repo) using this concept. This bot imitates users and trending hashtag discussions, so send it some tweets if you want more examples. Wood. I bought four 3ft lengths of 3"x1"
Extension Cord with multiple plugs. 50cm x 70cm Ikea STROMBY frame. Additional required tools/supplies are: scotch tape, a squirt bottle, dish soap, a drill or screwdriver, exacto knife, scissors, and a saw. March 10, 2018 update: I'm currently in the process of trying out an actual two way mirror as well instead of the window film. If you're interested in this I can recommend this mirror which comes in several sizes. I'll have a post coming soon with instructions for how to mount it. The two way mirror is the most essential part of this build. To create this component, you just apply Gila Mirrored Window Film to any piece of glass or acrylic. This works equally well for glass and acrylic, and only takes about 15 minutes. My trusty RPi3 twitter bot server "starkiller". So let's say you've got a twitter bot that you want running 24/7, but you don't want it running on your personal system. What you need here is a server, which is really just a dedicated system. Note, if you're looking for a web server, you'd be better off with Amazon's AWS . If you're running automated tasks and answering tweets however, a Raspberry Pi is an excellent choice. 1. Setup a computer (raspberry pi) to run your program. 2. Write a script to launch your program. 3. Run the script automatically at startup. The starting point here is simply to buy a Raspberry Pi. RPi3 is great because it has build in wifi, and it's very affordable, any generation will work though. Once you've got the hardware, you need to install an OS. I strongly recommend Raspbian Jessie with Pixel (download and install guide can be found here). I want to document this project, as it is one of my favourite projects to date. This took place about 4 years ago while I was working at the Irish Centre for High End Computing (ICHEC). 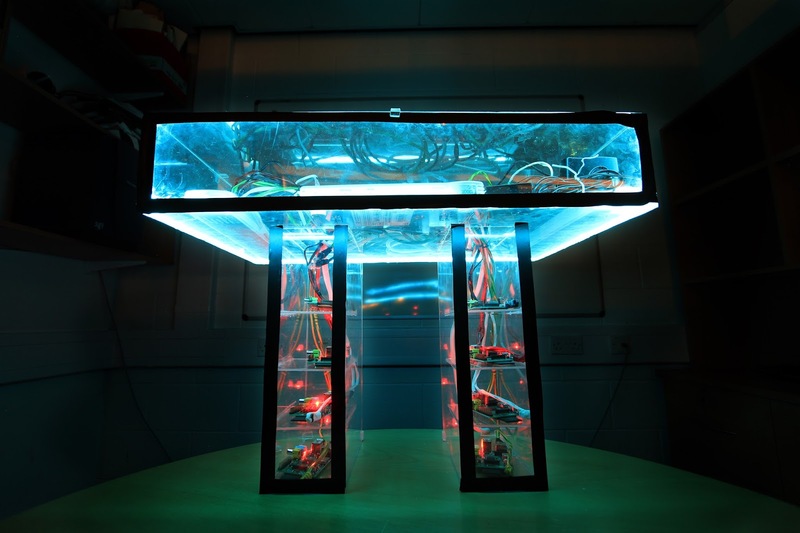 One of ICHEC's projects at the time was creating demonstration for the BT Young Scientist Exhibition to explain the use of parallel computing. I volunteered to build a Raspberry Pi cluster for this, along with a parallel demo application called Conway's Game of Life. The (very old) code can be found here, and more details about the simulation can be found in the official handout. The best part of the project was building the cluster. 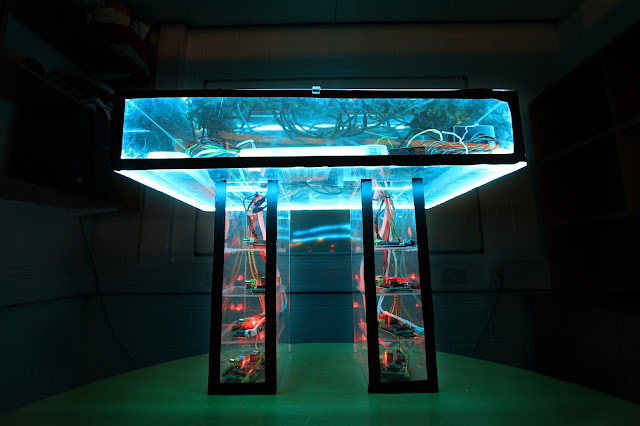 My design placed the 8 Raspberry Pi's into the legs of a plexiglass enclosure shaped like the pi symbol. I also wrapped ethernet cables in colour electrical tape to give them distinct colours, and added several strands of EL Wire to make it glow. Here are a couple of photos of the cluster and build process.